Roof Damage Insurance Claims - ALL RISK PUBLIC ADJUSTERS "
Roof damage insurance claims are complicated for several reasons. Damage to a roof often results in additional damages inside the building, and the age and condition of the roof prior to the event is taken into account when determining loss. What’s more, the policyholder’s first duty is to prevent further damage. Research has shown that a modest breach in a building’s envelope can increase internal pressure and result in uplift or a blowout of the wall system. The removal of a roof panel by wind uplift can increase losses by 80% of the total insurance claim. It may be necessary to decide – without the input or authority of your insurance company – to install a temporary or replacement roof. The decision you make and how it’s documented can impact your claim. Roof damage can be obvious – such as missing or broken shingles, roof sheathing or roof trusses – or not obvious. Other obvious damage includes an uplifted roof membrane, marks from flying debris or scouring of shingles. Nonobvious damage includes cracking on the underside of a flat roof membrane or built-up flat roofs that have multiple leaks after a disaster. Torqueing of roof equipment, like AC units, can break a roof membrane and cause leaking. Negotiating an insurance claim with the insurance company can be difficult, especially when damage is not obvious. Plus, most insurance policies exclude pre-existing conditions and maintenance issues. Therefore, it is necessary to differentiate between old damage and new. We have seen cases where a settlement based on the insurance company’s initial inspection does not cover the full repairs required for recovery. 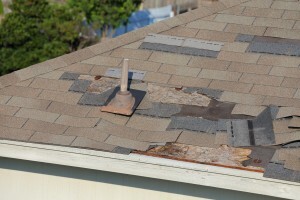 With your permission, roof cutouts may be taken in order to analyze the samples and make these determinations. Our claims adjusters can help you consult a roofing expert and a structural engineer to ensure that you get a fair settlement. As the policyholder, the burden of mitigating and proving your roof damage insurance claim is on you. However, you don’t have to do it alone. With ALL RISK Public Adjusters on your side, you can rest assured that your insurance claim will represent your best interests. We work on your behalf to get a settlement that enables your full recovery, as quickly as possible.